2905 Col.-Sergt.-Inst Edward Pullen; France 28th February 1915 until 5th January 1919*. 166 Col.-Segt. William Barker; France 28th February 1915 until 9th October 1918*. 479 Sergt. Henry D Rye; discharged to Commission in the 8th Battalion*. 261 Sergt. John Littlewood; transferred to 3/6th Battalion and disc 21.4.16 TE*. 76 Sergt. WIlliam Kay; France 28th February 1915 until 17th April 1918*. 71 Sergt. William Hopkins; France 28th February 1915 until 16th May 1917*. 77 Corpl. Thomas William Sheppard; Served in France with 2/7th and 15th Battalions*. 819 Corpl. George Fearn; France 28th February until 26th September 1915. Wounded*. 812 Corpl. 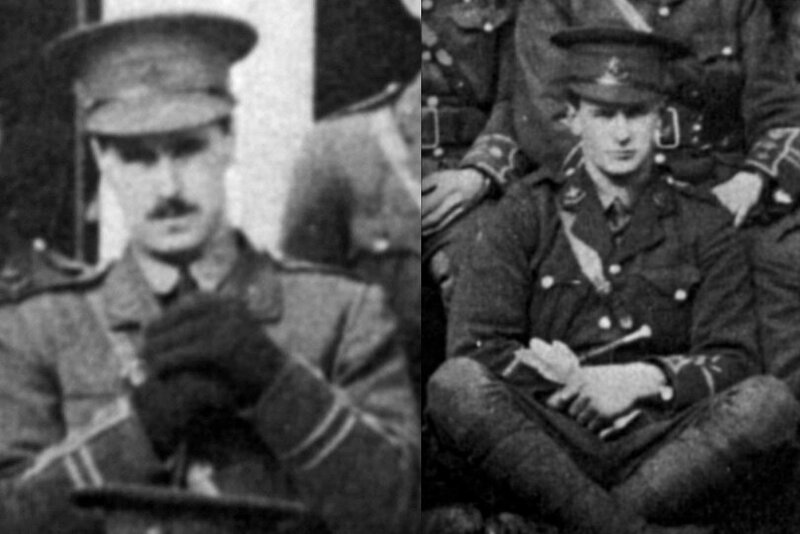 Hubert Bacon; France 28th February 1915 and disemb 21.3.19. 1584 Pte. Walter Wright; France 28th February 1915 until 27th December 1918*. 2056 Pte. Herbert Birley; France 28th February until 16th October 1915. Wounded*. 2054 Pte. Arthur Edward Webster; France 28th February; Disc 20.10.15 sickness. 2055 Pte. Tom Webster; did not serve overseas. 1794 Pte. Harry Blagden; France 28th February until 6th December 1918. Wounded*. 2053 Pte. Bert Birley; France 28th February 1915 until 12th May 1916. Wounded*. 1574 Pte. John William Hopkins; France 28th Feb 1915 until 23rd Jan 1919. Wounded*. 1573 Pte. George William Turner; France 28th February 1915 until 17th February 1919*. 1743 Pte. William Alexander Lytle; France 28th February 1915; discharged to Commission. 1742 Pte. James Bradford Lytle; France 28th February 1915; transfered to Labour Corps. 1753 Pte. John Mellor; France 28th February 1915 and disemb 27th February 1919. 1507 Pte. Joseph W Marsden; France 28th February until 18th October 1915. Wounded*. 1512 Pte. Frank Smithhurst; France 28th Feb1915 until 17th Feb1919. Wounded*. 2242 Pte. Hubert Fewkes; France 28th February 1915; killed in action 27th May 1915*. 828 Pte. Frederick Robinson; France 28th February 1915; disemb 24th February 1919. 1791 Pte. Harry Bacon; France 28th February 1915 until 27th March 1916. Wounded*. 1805 Pte. Walter Percy Evans; France 28th February 1915 until 29th January 1919*. 1411 Pte. John Bright; France 28th February 1915 until 29th January 1919*. 75 Pte. Ernest Goldstraw; France 28th February 1915; discharged 14th December 1918. 815 Pte. Peter Bond; France 28th February 1915; died of wounds 6th June 1917*. 825 Pte. Richard Large; France 28th February 1915 until 23rd October 1918. Wounded*. 1373 Pte. Ernest Jordan; France 28th February 1915; discharged 27th June 1916. Wounded. 2226 Pte. Arthur Stubbs; France 28th February 1915; disc to Commission; k/a 10.5.17*. 2240 Pte. Edward Robinson; France 28th February 1915; transfer. Sch Musketry; Wounded. 1342 Pte. John Andrews; France 28th February 1915 until 11th December 1915. Sick*. 1216 Pte. Thomas Hambleton; France 28th February 1915 until 16th February 1916. TE*. 2121 Pte. Frank Pullen; did not serve overseas. 816 Pte. William Burrows; France 28th February 1915; disemb 2nd April 1919. Wounded. 1799 Pte. Thomas Chesterton; France 28th February 1915; disemb 15th May 1919. Sick*. 1384 Pte Frederick Annis Barker; France 28th February 1915; TE 29th February 1916*. 1397 Pte Edward Hall a mill hand from Litton Mill and a pre-War Territorial who originally served with “D” Company returned to England on “SS VIPER” as ‘Time Expired’. 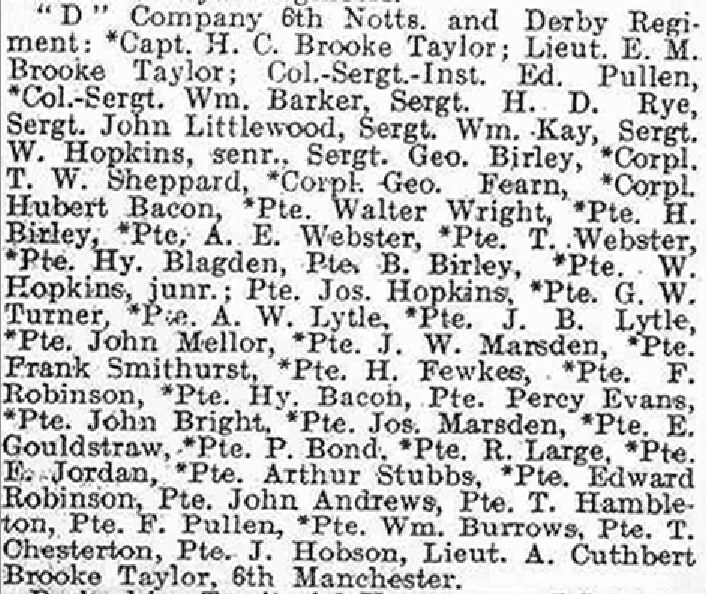 1588 Pte Walter Wragg a cotton operator from Little Hucklow and a Pre-War Territorial who served in “D” Company. Admitted to 1st North Midland Field Ambulance with scabies. 2049 Pte Frederick Ernest Whitehead a miller’s labourer from Rowsley and a Pre-War Territorial with “D” Company.